The OECD Economic Survey 2014 indicates that Canada experienced solid economic growth in recent years, despite the recession in 2008. Estimates show that Canada’s GDP will grow between 2.5 to 2.7 per cent in 2015, for instance, which is a welcome sign for the Canadian economy. A country’s overall economic performance, however, does not reflect regional economic performance. In Canada, although the economy has been performing well nationally, the regional economic outlook is a different story–one of divergence across provinces. As shown in the chart below, with the exception of a few oil producing provinces, economic growth in most provinces grew less than the national average in 2013. Nova Scotia’s GDP, for instance, has grown slower than the national average for roughly two decades. In fact, in recent years, Atlantic Canada has experienced a significant outmigration of younger individuals and families, which not only affects the labour force, but also human capital–two of the most important determinants of economic growth. 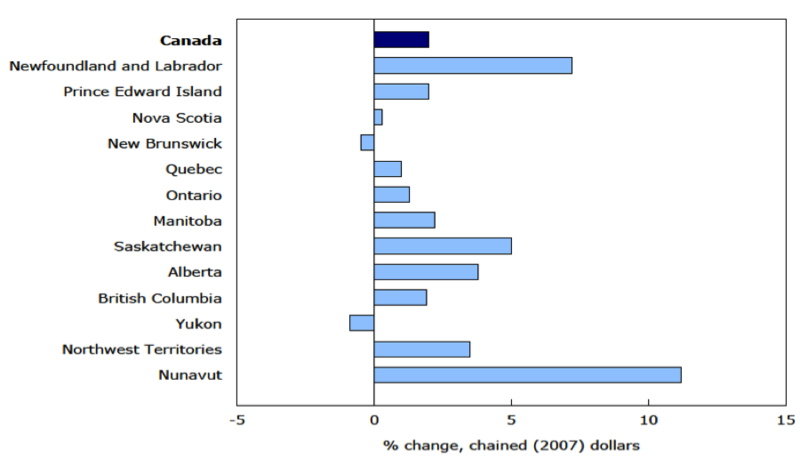 The widening gap in economic performance across provinces is a serious threat to struggling provinces, such as those in Maritime Canada, where in recent years equalization payments from the federal government have declined as a share of GDP, due primarily to Ontario’s becoming a “have-not province.” This decline poses some economic and fiscal challenges to New Brunswick, Nova Scotia, and Prince Edward Island and these challenges may persist if Ontario’s economy continues to underperform. Equalization payments, and more broadly, federal transfers, comprise a significant share of Maritime Canada’s GDP. In fact, these provinces rely on federal transfers as a fairly substantial source of revenue and a small reduction in the share of equalization payments to those jurisdictions has a substantial impact. Notwithstanding those developments that pertain to Canada’s equalization programme, the biggest obstacle facing the Maritime region is economic growth. Provincial governments in Maritime Canada should simplify the tax system, streamline regulations, and create an economic environment conducive to growth. Adopting more efficient policies that encourage competition is a good start. This entry was posted in Economics and tagged disparities, disparity, economic growth, OECD, regional development, taxation. Bookmark the permalink.